This kinesiology tape from AZSPORT is really great. This is designed for athletes and really helps to give added support especially when injured. You can use to target specific muscle groups to help relieve pain and stress. It’s a great high quality tape, just peel off the backing and apply where you need the support. It’s water and sweat resistant so even if you are wearing it during a workout or sport activity it still stays stuck where you put it. I have some knee and ankle injuries so working out is really hard for me due to those injuries. I tried out the kinesiology tape and felt like both my knees and ankles were well supported during the workout and it made my workout much more enjoyable and less painful. INSTANT PAIN RELIEF – Advanced technology to relieve pain and sore muscle. This kinesio tape is better than any pain reliever or medication. Say goodbye to traditional strapping. No more adhesive bandages, no more braces even Post Surgery with the help of kinesiology. This athletic tape also helps prevent or relieve spasms and cramps in overused or injured muscles. ENHANCE PERFORMANCE – If you are into swimming, running or even doing Athletic Sports Crossfit, this kinesiology sports tape is for you. The athletic tape that is ideal for everyone who wants to perform at their best. With the Kinesio Tape, there’s no need for traditional taping and other strapping methods. You can challenge your limits and outdo the competition. SPEEDY RECOVERY and MAXIMUM RECOVERY – Designed to work with your body and flex with your muscles to support the injured muscle or joint without restricting range of motion. This is not the usual taping you use to bring relief to back and muscle pain during intense activities. 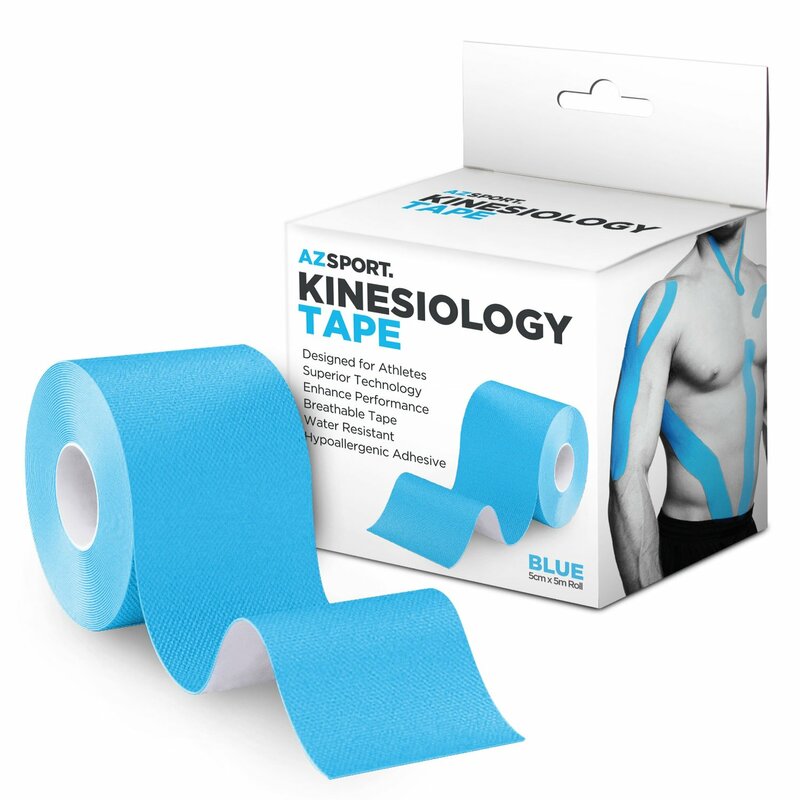 This kinesiology sports tape offers more than joint and muscle support, it also aids blood circulation, lymph drainage and promotes healing for a fast recovery. THE BEST VALUE – Heavy duty, Hypoallergenic, Latex-Free, Water Resistant and Skin-friendly adhesive. Not pre-cut. The continuous roll ensures you get the most out of your purchase. You can cut it to the size and shape you need for your specific injury or performance requirement. Superior technology at a reasonable cost. GOLD MEDAL GUARANTEE- With AZSPORT, you’re taking on absolutely no risk. Our unconditional Gold Medal Guarantee is limitless. If you’re not thrilled with your purchase for any reason, just tell us and we’ll refund 100% of your purchase price!